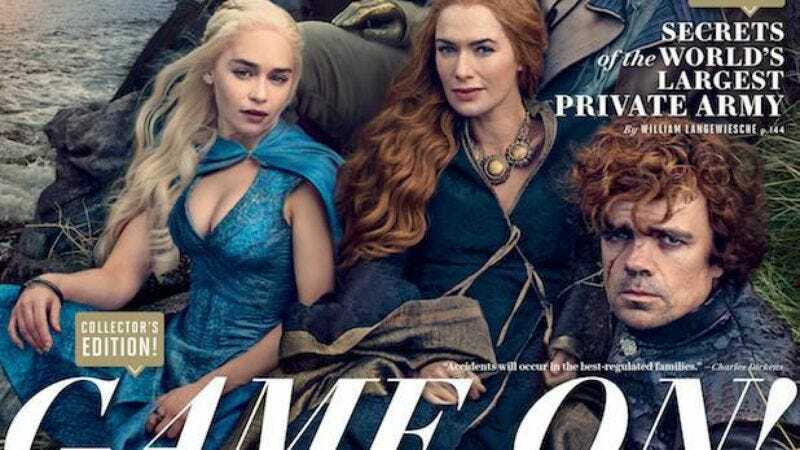 The cast of Game Of Thrones appears on the latest cover of Vanity Fair, and besides giving Vanity Fair readers their first taste of a genuinely interesting “royal intrigue” story, their profile also attempts to clear up some lingering questions about how the show hopes to conclude—especially as the show rapidly approaches the point in the Song Of Ice And Fire saga where George R.R. Martin just has a Garfield Post-It note with some doodles of swords on it. For their part, showrunners David Benioff and D.B. Weiss say they would definitely like to see Game Of Thrones wrap after seven or eight seasons. “It doesn’t just keep on going because it can,” Weiss says. “I think the desire to milk more out of it is what would eventually kill it, if we gave in to that.” And with that deadline in mind—as well as the advancing age of the show’s child actors, who may all have child actors of their own by the time Martin gets done—Martin tells Vanity Fair he’s well aware that “this is a serious concern… Time is passing very slowly in the books and very fast in real life.” And so Martin is currently doing everything he can to address it, by sitting down for another interview, instead of actually writing those books.